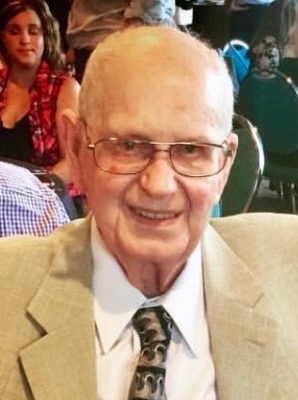 Omah Douglas Dalton, Sr., 88, of Fremont, OH passed away on Sunday, February 3, 2019 at ProMedica Memorial Hospital. He was born September 2, 1930 in Virginia to Ida Keatts. Omah married Mattie “Francis” Bohanan on March 5, 1952 and she preceded him in death on August 16, 2015. He worked as a welder for the Pipe Line Union #798 in Tulsa, OK. Omah was a member of the Fremont Eagles and Moose Clubs. He loved welding and his Union. He also enjoyed wintering in Florida with his wife for over twenty years. He loved to spend time with his family especially his grandchildren. Omah is survived by his son, Douglas Dalton, Jr., Fremont, OH; grandchildren, Darcy (Bernie) Druckenmiller, Derek (Julia) Dalton, Dana (Meni) Ontiveros; great grandchildren, Taylor John, Makayla and Kasey Druckenmiller, Olivia and Camden Dalton, Quinn and Lucy Ontiveros; siblings, Lyn Keatts, Garreth Keatts and Ed Keatts. He was preceded in death by his mother; wife, Mattie “Francis” Dalton; brother, Jimmy Keatts. Visitation: Thursday, February 7, 2019, from 11:00 am to 1:00 pm at Wonderly Horvath Hanes Funeral Home and Crematory, 425 E. State St, Fremont, OH. Services will follow at 1:00 pm at the funeral home. Offer Condolences for the family of Omah Douglas Dalton, Sr. I am so sorry for your loss. May God comfort your mourning hearts. I pray that you find comfort in Revelation 21:3-5. This scripture paints a picture of a world that is very different from what we see today. A world with no more sickness, pain or death…and it is not a dream, it is a promise from God. He promises to reverse the effects of death and resurrect your precious father, grandfather, great grandfather, brother, and friend. You will never have to say a painful goodbye ever again!